To Hang or Not to Hang? Hammock Camping is the Question! In some respects, switching to a backpacking hammock over a traditional ground tent is a no-brainer for northeast hikers. With a hammock you don’t have to worry about playing tent-platform Tetris, or asking for the “overflow spot” (aka the drainage area), at busy campsites. In fact, you don’t have to worry about campsites at all. Want to hike the Appalachian Trail until dusk without fear of finding a tent spot? Go for it. With a hammock, all you need is two trees yay-distance apart, and there’s nary a trail in New England that doesn’t meet that criteria. Best of all, hammocks have little to no impact on the environment for leave-no-trace ethics. And yet, if you’re considering a hammock, something is probably giving you pause. That something is likely the fact that you already own a tent, and it’s hard to justify the expense—especially if your spouse/parents know you already own said tent—for something that seems so, well, foreign to your camping senses. Believe you me, I’ve been there. Two years ago I made the leap of faith in a camping hammock, and I’ve backpacked happily ever after since. To help you decide if you’re ready to hang loose, I’ve detailed the questions I had before switching, as well as the answers I’ve learned. I hope you find it helpful. What’s the best backpacking hammock? Gathered-End Hammocks — The most common option, these are the banana-shaped hammocks where the ends are bunched together. For a good night’s sleep, you want to orient yourself diagonally in a gathered-end hammock for a flat(ish) lie. Bridge Hammocks — These are naturally flat due to a spreader bar at each end of the hammock. This can mean more weight, but some bridge hammocks allow trekking poles to be used as the spreader bars. Learn more about gathered-end and bridge hammocks on Andrew Skurka’s website. 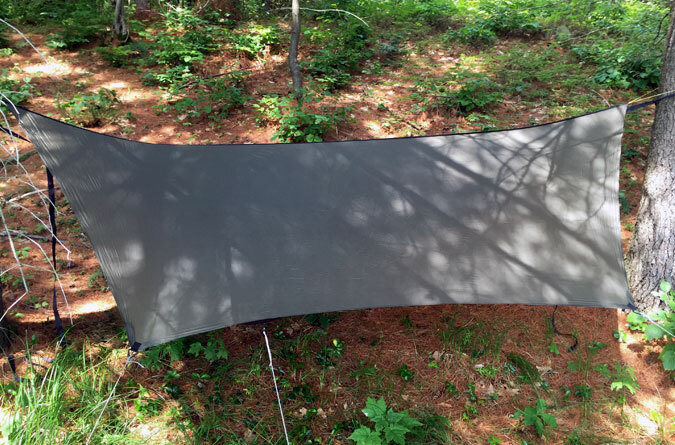 As for picking the best hammock, I own the Warbonnet Blackbird and I’m infatuated with its built-in bug net and specialty features such as the footbox and storage shelf. That said, the Blackbird is the only hammock I’ve used, so I’m highly unqualified for a best-of judgement. Fortunately, you don’t have to take my word for it. Outdoor Gear Lab named the Blackbird its “editor’s choice” award. For the sake of objectivity, Hennessey Hammocks, Clark Hammocks, Eno Hammocks, and Jacks ‘R’ Better all have equally devoted followers. It’s also worth noting that there are a bunch of duel-purpose camping hammocks on the market that are meant for backpacking or backyard leisure. At first glance these hammocks appear to be the economical and lightweight choice, but keep in mind that northeast backpacking essentials such as bug nets and rain tarps are often sold separately. 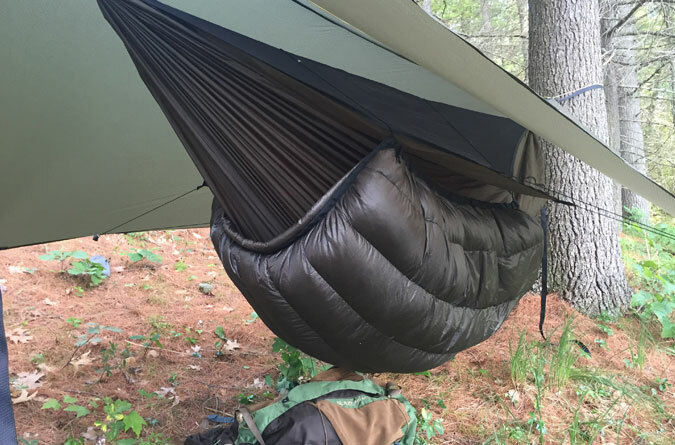 This modularity is great if you’re seeking versatility, or are an experienced hanger wanting to customize your system, but as a newbie I just wanted a full package of everything together to keep it easy, and some hammocks are sold this way. Will I fit in a hammock? Be sure to check the weight and height rating on a hammock before purchasing. The Blackbird, for example, has several versions, the largest of which can support up to 400 pounds and fit a person up to seven feet tall. Can I sleep in a backpacking hammock? Yes. Probably. I think so. Okay, only you can truly judge this for yourself. What I can say is that I’m a stomach/side sleeper who fidgets. A lot. If there’s a sleeper profile that might not be good for hammocks, I’m it. And that first night of hanging was definitely an adjustment. Thereafter I was fine. Now, I daresay I sleep better in a hammock than a tent. Laying at a diagonal in gathered-end hammocks essentially creates a flat plain. Through this I’ve found that I can sleep snugly on my back, as well as on my side. Will I be warm enough camping in a hammock? Like with tents you can get a rain fly/tarp for your hammock. Unlike tents, the tarp isn’t attached directly to the hammock. Instead it is set up over the hammock, which provides the advantage of adjusting the height and angle of the tarp based on your preferences and the weather conditions (see below for suggestions on staying dry in the rain). For added protection, some tarps come with doors, or have the option of adding a door kit, to provide coverage on all four sides. Underquilts provide a down layer of insulation under the hammock. While underquilts are available in full-body length and torso length, I’ve found the torso-length quilt to be adequate for three-season outings. The nice part of the torso-length quilt is that it can be moved up and down the hammock to adjust your comfort zones. Like with sleeping bags, underquilts have different down fill and temperature ratings. A Warbonnet Blackbird hammock with a Yeti underquilt. Double-Layer Hammocks and a Sleeping Pad If you were counting on eliminating a sleeping pad from the equation with a hammock—think again. Hammocks come in single or double-layer bodies (bottoms). The double-layer bodies are more durable and have more weight capacity, but most importantly they allow for a sleeping pad to be slipped between the two layers. Sleeping pads can still be used with single-layer hammocks, you’ll just lie directly on the pad. I’ve found the Therm-A-Rest Z Lite Sol Mattress to be a perfect hammock companion because of the reflective coating that helps trap body heat. This is a crucial part of my warmth system, as the temperature difference for any body parts that slip off the pad is huge. It’s also handy to have a pad with you in case you decide to stay in a shelter instead of hanging. On those colder nights you’re going to want to pack essentials such as long johns, fleece pullover, down jacket, heavy wool socks, fleece/wool hat, and glove liners. When the temperatures aren’t too low, I’ll leave the long johns and fleece at home to save weight, and wear my rain coat and pants if an extra layer is warranted. Because I’m follicle challenged, I also include a lightweight down pillow. Can I stay dry in a hammock when it rains? If you’re careful, yes. One advantage hammocks have over tents in the rain is that you can hang the rain tarp first, allowing the hammock to be hung under cover. You also want to set the hammock suspension straps higher than the tarp guyline and tie the sides down at a steep pitch on both sides. The goal is to get the tarp as close to the hammock as possible without the two actually touching. Also set a simple drip line to prevent water from running down the suspension straps. Site selection is key in foul weather. Try to find a spot within thick tree cover to avoid sideways rain from the wind. Setting up on the lee side of a hill or shelter will also provide wind protection. Lastly, make sure the hammock openings aren’t set in the direction of the wind. Do hammocks weigh less than tents? It depends on the type of hammock system you’re using and the weather conditions. There are ultralight hammocks that weigh as little as 6.5 ounces, but they typically don’t include a bug net, rain tarp, or other creature comforts such as a double layer bottom. Weather comes into play here because in warm temperatures you could skip carrying a sleeping pad or underquilt. For the sake of comparison, if we do a search on REI for one-person ultralight tents, and the top six tents weigh from 1 lb. 10 oz. to 2 lbs. 2 oz. (fly and footprint not included). A search for hammocks gives a range of 6.5 oz. to 1 lb. 11 oz. This makes it look like hammocks weigh less, but it all comes down to your commitment to ultralight versus comfort. For most systems, the hammock-tent comparison is likely to come out pretty even. Do hammocks cost less than tents? The answer here is the same as with weight above. There are a wide range of hammock and single-person tent prices. Some hammocks sell for as little as $70, but keep in mind this is just the hammock. By comparison, a Warbonnet Blackbird system complete with tarp and underquilt will be about $500. The above tent test found a range of $219 to $370. Should I get a two-person hammock for my spouse and I? Are you trying to get divorced? If one person moves in a hammock, the other feels it. Get up to go to the bathroom, and the other person is going to be swaying. It’s a recipe for sleepless nights. And bickering mornings. So, you know, good luck with that.